Unlike Millennials, older folks have a hard time catching up to the technology. Most older people just don’t feel the need to include technology in their day to day lives, especially the smartphone. So how do we get them to use those apps or which apps to download? Well, I have made a list of apps for old people especially if they live alone. As people grow older some bodily functions, like vision, hearing, and mobility decrease over time. There are apps out there which can alleviate these problems. The apps listed are only for more common disabilities like poor vision, hearing loss, and limited mobility. For a more comprehensive list, you can check out apps to make Android easier for senior citizens. iOS has the most accessibility features which are designed keeping old people in mind. iOS’ Accessibility features can help you adapt to technology more conveniently. To find all these features go to Settings > General > Accessibility. My grandpa is always looking for his trusty old magnifying glass to read the newspaper. Little does he know the Magnifier on his iPhone converts the iPhone’s camera into a digital magnifying glass. 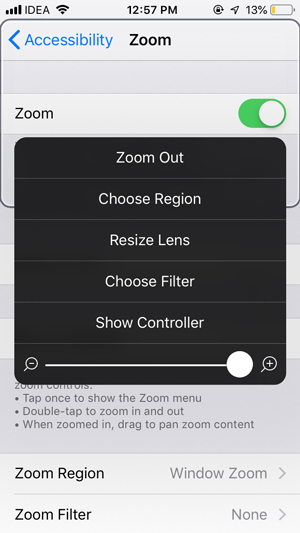 Simply, activate the feature from the Accessibility settings and launch the Magnifier from the Control Center. You can adjust the zoom by sliding the bar on the bottom. It also has a flash option for low light magnification. Okay, the magnifier is good for magnifying real-life objects but the iPhone itself has tiny lettering and most older folks can’t really tell what they’re looking at on their iPhone or iPad. You can turn on Zoom accessibility to look at the finer print on the terms and conditions or while casually browsing the internet. It is the most used accessibility feature on the iPhone. 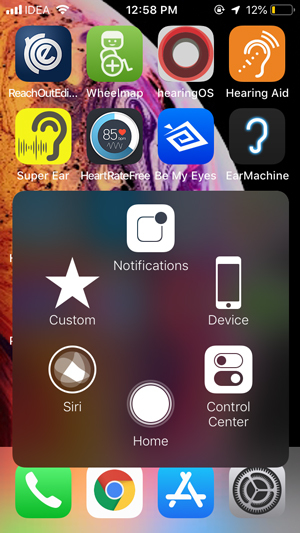 The white dot sits on the edge of the iPhone screen and you can quickly access options like notifications, Home, Control Center etc. AssistiveTouch is recommended for people who have difficulty touching the screen. It supports single-tap, Double-tap, and long press and you can set custom actions with AssistiveTouch. This would trigger a specific action like lock screen, mute, SOS, etc. If an app requires a set of gestures, you can create those as well in the Settings. 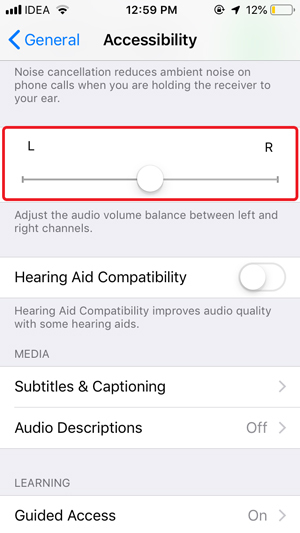 This accessibility feature lets you adjust and balance the audio to your left and right ear. This can come in handy for people who have hearing loss in one of their ears and adjusting the audio can offer a more balanced sound overall. 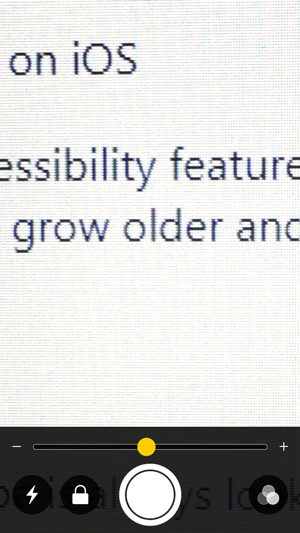 VoiceOver is a great accessibility feature for old people. It offers audio feedback for every step you take after turning it on. You can customize the speed, speech, and verbosity according to the user. This guided step by step narration can help them in navigating the iOS without any external guidance. Accessibility features on Android are similar to the iOS and you can get almost all the features on any Android device. Implementation of accessibility features can be limited or augmented by OEMs. Just like iOS’ VoiceOver, TalkBack can help to make interactions with the smartphone easier for old people. You can interact with elements of the screen and select the apps and buttons with guided access. You can make the feature more customizable for your older folks in the settings. Find the service in Accessibility Settings. Go to Settings and search for Accessibility and Turn on ‘TalkBack‘. Unlike iOS’ Magnifier, Android’s Magnification zooms the content on the phone’s screen rather than behind it. All the gestures and controls vary from device to device and you can check out yours in the settings. Find Magnification in Accessibility settings. Go to Settings and search for Accessibility and turn on ‘Magnification‘. Wheelmap has the largest database of wheelchair friendly places. 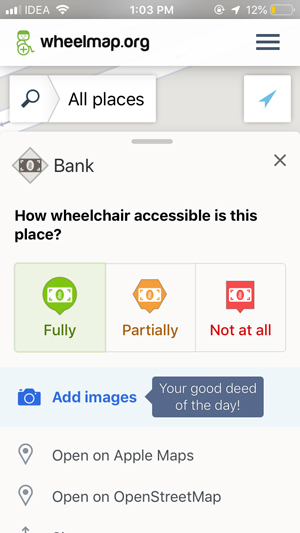 You can simply open the app, enter the place you wish to visit on the map and it shows if it is wheelchair friendly or not. All the places shown in green are fully wheelchair accessible, yellow partially, and red not at all. What’s even better? You can add to the list by adding the flair and add images to the places which aren’t flagged on Wheelmap yet. Wheelmap is free. A smartphone can’t replace a quality hearing aid but it certainly complements one. Enter Ear Machine, an iPhone app that enhances the ambient sounds for people with mild hearing impairment. You can install this app and connect your pair of headphones to listen to ambient sounds clearly. 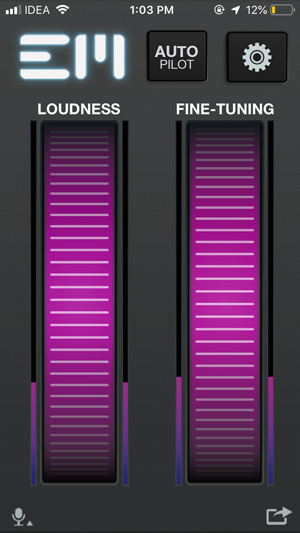 The app has two dials which you can swipe to fine-tune and adjust loudness. The app automatically reduces ambient noise and lets you focus on the conversation. Ear Machine is free to use. This next app is an Android exclusive Speech to Text app which works in real time. While still in Beta, it works amazingly well. As you speak, the app processes your speech and converts it into sentences. You can adjust the text which displays on the screen, select a language(from 70 different languages), and set a dark theme. This app also has an option to mask profanity to keep the conversations clean. The only limitation with the app is that it requires an active internet connection. 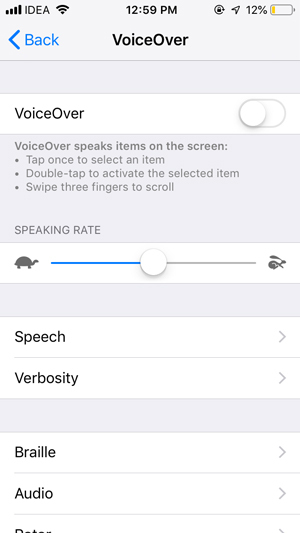 Sadly, iOS hasn’t implemented this feature natively yet but you can still get decent Speech to text with Voicea on your iPhone it works in real time and would be helpful in conversations with old people. Voicea was not intended for old people but it works well for our case and its free. Sound Amplifier, just like Ear Machine amplifies the ambient sounds using the phone’s mic. 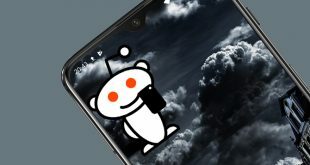 The app is natively installed in all the Pixel 3 devices and you can activate the app from the accessibility settings and tap the Accessibility button to run it. Others can download it from the Play Store. The app doesn’t have an interface and runs silently in the background. You can fine tune the settings and adjust the boost in the Accessibility menu. Sound Amplifier is still in beta and doesn’t support every Android device yet. Super Ear Tool is a similar app for Android users who can’t install Sound Amplifier. 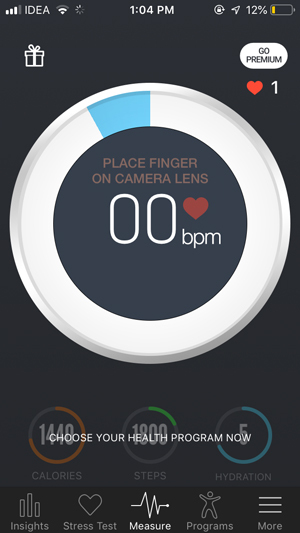 This next app lets you calculate your heart rate using the iPhone’s camera sensor and flash. The principle is similar to traditional IR Pulse sensor, a light source illuminates your flesh and the camera captures the blood flowing through the capillaries. To measure the pulse turn on the app and put your finger on the camera sensor and the flash. The app works fine and gives a reading with an error of (±)10% and I would not recommend it over a professional pulse tracker but you can use this to get an approximate idea of your pulse. One thing which I noticed during testing this app over multiple devices was that some devices have a very bright flashlight and it gets really hot and almost unbearable. I would only recommend it for iOS devices as the Flash on those devices doesn’t burn your skin on close contact. The app is available for iOS and Android. Falling down in old age can be serious especially for seniors living alone. Chk-In Fall Alert is an app which senses if a person has fallen down using the smartphone’s accelerometer. Using it is simple, after setting up the app, it runs silently in the background, if a person falls down they can simply, shake the device to trigger a distress signal and the app would automatically send it to the emergency contact. This app can come as a lifesaver if your old folks live alone and you want them to be safe. ADA is a health guide app which helps you identify any health problem by asking questions. The best part about the app is the minimal interface and old people can easily learn to use. To start a diagnosis, tap the assessment button and answer the questions asked. If you answer correctly, the app shows you possible causes for the discomfort along with a diagnosis. It can come in handy for old people who can’t go to the doctor every time their tummy hurts and still be sure of the symptoms. The app also keeps a log of assessments and you can keep track of specific symptoms as well. ADA is free and available for Android and iOS. My old timers struggle with everyday tasks like selecting a button on the remote or reading the expiry on the milk carton. Be My Eyes is an excellent app designed to help visually impaired and old people. The app has two parts; the volunteers who assist the old and visually impaired and the users who need assistance. While setting the app for your grandparents, enter all the languages they can communicate in. That’s about it. The app only has one button to initiate a request for a volunteer. You can tap this button to connect with a volunteer, they’ll only see the rear camera footage your screen. Plus, to keep the volunteers anonymous, you can only hear their voice. The app can take up to one minute to connect with a volunteer. 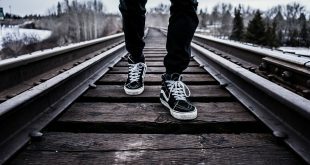 After the app connects with you a volunteer, you can ask them to help with any query that you have. Be My Eyes has a strong community of 100,000 volunteers across the world. Be My Eyes is free and easy to use, you can get it for Android and iOS. These were my picks as the best apps for old people. These are more general apps aimed to solve common old age ailments like vision and hearing loss. these apps are not just limited for old people and anyone can use them. For example, Sound Amplifier and Live Transcribe from Google work in real time to offer sound and speech solutions with the help of technology. Chk-In Fall Alert notifies if someone falls down and they can send an alert to their emergency contact. Did we miss any app which can help old folks? Tell us in the comments below and we’ll add to the list.